Yesterday’s North Korean missile launch, confirmed as an intercontinental ballistic missile (ICBM), was the culmination of 70-plus years of unresolved conflict between Pyongyang and Washington. But despite tough talk and tougher tweets from the current presidential administration, the U.S. feels like it has fewer options than ever—and that includes with China. Japan and the United States responded with their own military drills and the Trump administration warned that it would use “the full range of capabilities at our disposal against the growing threat,” as quoted in the New York Times. North Korea defiantly asserted that its Hwasong-14 ICBM was a “Fourth of July gift” for the U.S.
Sue Mi Terry, a former CIA analyst who is now managing director for Korea at the government affairs and public policy consulting firm BowerGroupAsia, said she met with North Korean government officials last month in Sweden to explore possible resuming the six-party talks that fell apart in 2009. There, she said she was told Pyongyang was preparing to test an ICBM. They also told Terry and her colleagues that freezing its nuclear weapons program is out of the question. She said she and some of the other delegates left the meeting more pessimistic about negotiating with the north than they did before. So if that is not an option, what is? Certainly not a military one. War would lead to unspeakable casualties and another quagmire for the U.S., not to mention a crisis that totally destabilizes the region. The reality is that Washington is in the weakest negotiating position it has been in. Former Secretary of State Madeline Albright and former Secretary of Defense William Perry negotiated a deal that convinced Pyongyang to suspend its nuclear weapons program during the 1990s (the GOP-lead Congress refused to fund it), but the North’s nuclear weapons program wasn’t as advanced as it is now. There was some wiggle room during the 2000s, but former President George W. Bush pushed the “Axis of Evil” campaign that angered the North Koreans. He did have some success until 2006, when Pyongyang conducted a nuclear test. By time Barack Obama inherited the North Korean problem, his efforts had fewer teeth than either Bush or Clinton. Basically, the situation is starting to get grim at this point. 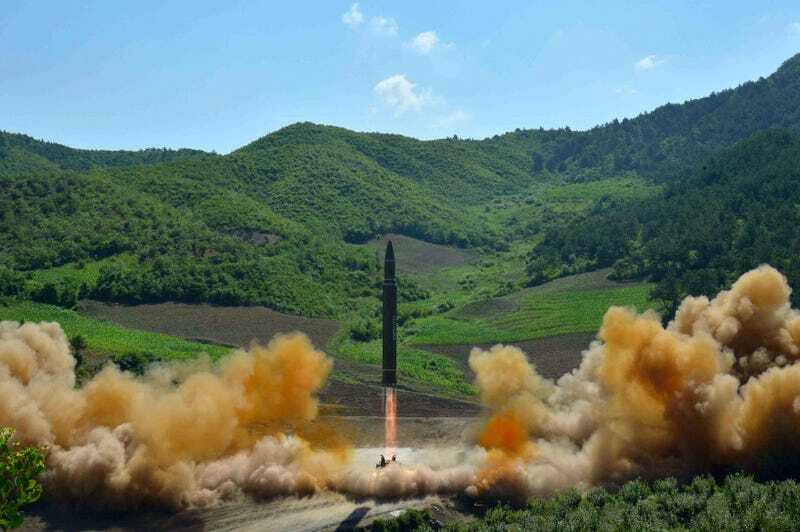 But there are some options for Trump to consider if he really wants a peaceful resolution and the while the recent missile test should worry Washington, it may not be quite as bad as we’d assume. What Does This Recent ICBM Test Mean? Yesterday’s launch is mostly symbolic. While the missile might have the capability to hit Alaska, that’s not prime real estate to carry out maximum damage. As David Wright, co-director of the Union of Concerned Scientists Global Security Program, told me, Pyongyang would ideally want to hit a high population area, like San Francisco or Los Angeles. The North hasn’t proven it can do that—yet. For one, we’re not sure North Korea can accurately target an ICBM, a technical aspect Moscow and Washington have spent years perfecting. Wright says one important thing to remember about ballistic missiles is that they are only powered for a few minutes during their flight before it becomes unguided. So you basically have to direct the ICBM for a 4,000 mile journey by adjusting its speed and direction when it’s only around 200 miles away from the launch point. Calculations—thrust, atmospheric drag, gravity density in different areas of the world— have to be perfect. Additionally, the sensor on the missile that measures acceleration has to be accurate. That sensor will ask itself questions such as “How fast am I going?” and “In what direction am I headed?” Once it determines it is on the right course, it will shut its engines down and continue its trajectory towards the target. In short, there is a big difference between tipping a short to intermediate-range ballistic missile with a nuclear warhead and one that can successful go into space and back down to earth and hit a target over 4,000 to 5,000 miles. We’re not quite sure if Pyongyang can do that, yet. But even if the North can’t now, they’ll eventually figure it out. While Tuesday’s test may not be a sign of North Korea’s ICBM mastery, it is a frightening indication of how quickly they’re working to eventually get a missile that can carry a warhead that can hit the American mainland, and how quickly their missile technology has escalated in recent years. As you’ve read on Foxtrot Alpha, China and North Korea have a historic political and trade relationship dating back decades, but it’s become strained in recent years as China has developed into a world economic power and North Korea has stayed the belligerent Hermit Kingdom. Trump, and every U.S. president before him, has long bemoaned Beijing for aiding and abetting Pyongyang’s flouting of international norms and brazen ballistic missile testing. And, to an extent, he is correct. During the 1990s and early 2000s, especially, the Chinese did not take North Korea’s nuclear ambitions seriously, but the same cannot be said in 2017. As I wrote before, China fears a collapse in North Korea leadership could result in a refugee crisis that will destabilize the region for decades to come. North Korea’s fall would also mean China would no longer have a buffer between itself and South Korea, where more than 30,000 troops are stationed. If a war were to break out between the United States and North Korea, then Beijing, not Washington, would be most impacted regionally by the bloodbath that would ensue—even if they do not join the battle. But that doesn’t mean that China is off the hook. While it did participate in U.S.-led sanctions against Pyongyang earlier this year, there is much more Beijing can do to force North Korea’s hand. Terry says sanctions have not worked because China has not enforced them on their end. Given that China accounts for more than 90 percent of North Korea’s trade, it would be ideal for them to cut back that trade significantly. The problem is that Chinese officials have long feared that doing so would not only cause a collapse, but it would turn Pyongyang against them. Moreover, it would turn Beijing against Washington, chilling an already frosty relationship even more. In other words, the U.S. is kind of damned if it does and damned if it does’t here. The regional players who do have some juice, China and to some extent Russia, are ideologically adversarial with Washington and vise versa. North Korea is geopolitical leverage for Beijing and Moscow, so they have no real incentive to cooperate with Trump. Or, more specifically, Trump has not provided them with any incentive to try. If Reagan Could Negotiate With Moscow, Can’t Trump Negotiate With Pyongyang? It’s not the same set of circumstances, but it is worth considering that many experts were pessimistic that real peace could be brokered between President Ronald Reagan and an equally stubborn Soviet leadership. Why, then, can’t Trump find a way to negotiate a freeze of Pyongyang’s nuclear weapons program with Pyongyang? As late as the mid-1980s, there were tens of thousands of nuclear warheads spread between Moscow and Washington. Now, there are around 15,000. Of course, it took a Mikhail Gorbachev who was willing to play ball with Reagan for that to happen. Previously Soviet heads of state were not as willing to negotiate. To this day, Gorbachev is viewed as a traitor against the Soviet state and even Russian President Vladimir Putin criticizes him for his decisions during the waining years of the USSR. But one thing Reagan had that Trump does not is a full clip. He had some of the best foreign policy minds in his White House crafting policy and the international community’s support. Trump has key vacancies in the State Department he seems not to want to fill right away—we still don’t have an ambassador to South Korea—an international community that despises him. Alexandra Bell, the Senior Policy Director at the Center for Arms Control & Non-Proliferation, told me Trump could hurry to get an ambassador to Seoul nominated. The State Department doesn’t have an assistant secretary of state for Asia, either. All of these issues are making it harder for Trump to craft solid North Korea policy. In Bell’s view, China needs to be pressured to do more and having a full supporting team would help Trump figure out how that can be done.